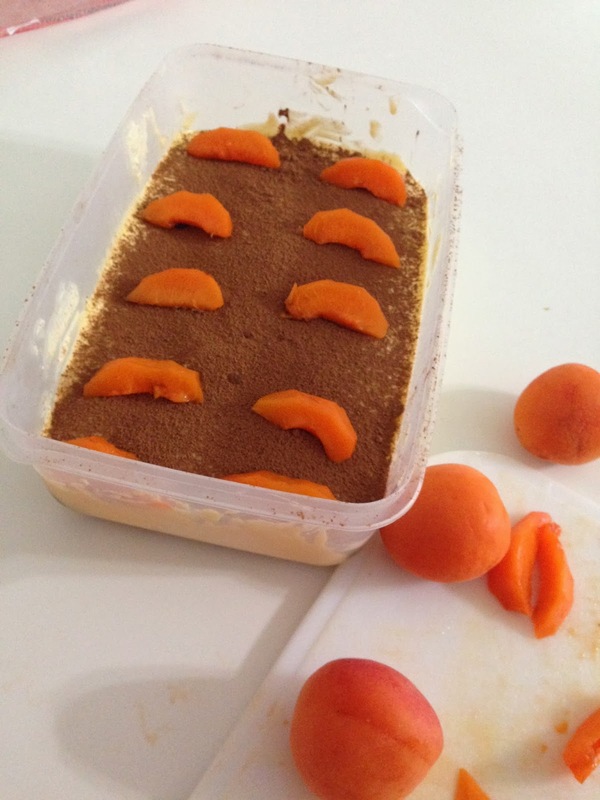 during the holidays, i had quite a lot of energy for cooking and baking and so i decided to make some Tiramisu out of the blue. i didn't realize though, that it was quite a complicated recipe. but i was really into doing it so i decided to get on with it anyway, despite the hard work. 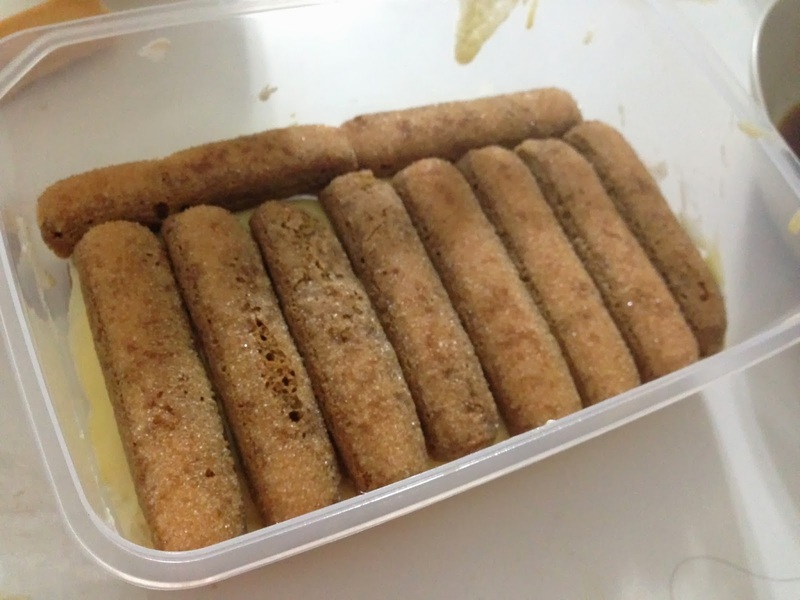 Tiramisu is originally from Italy and it literally means "pick me up". 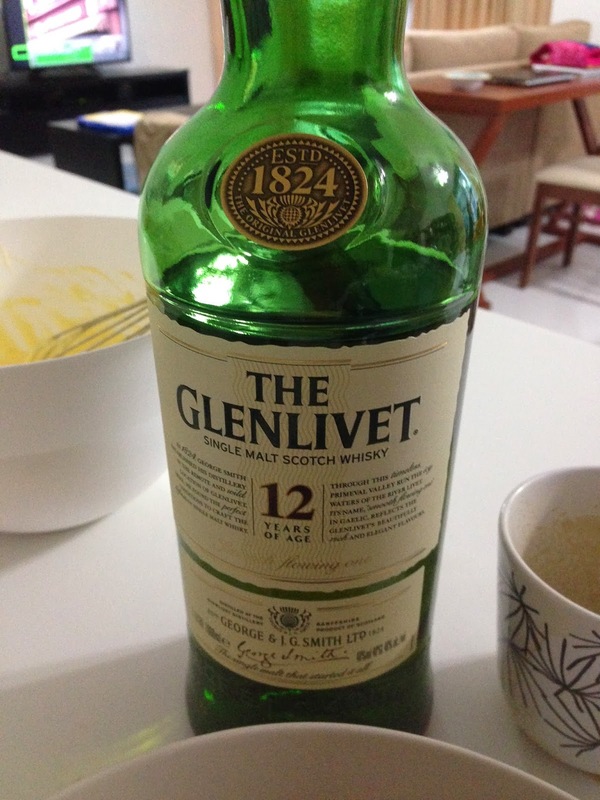 i guess it got the name from the ingredients -- rhum and coffee, which will literally pick your spirits up when you are feeling a bit less hyper and in need of waking up. 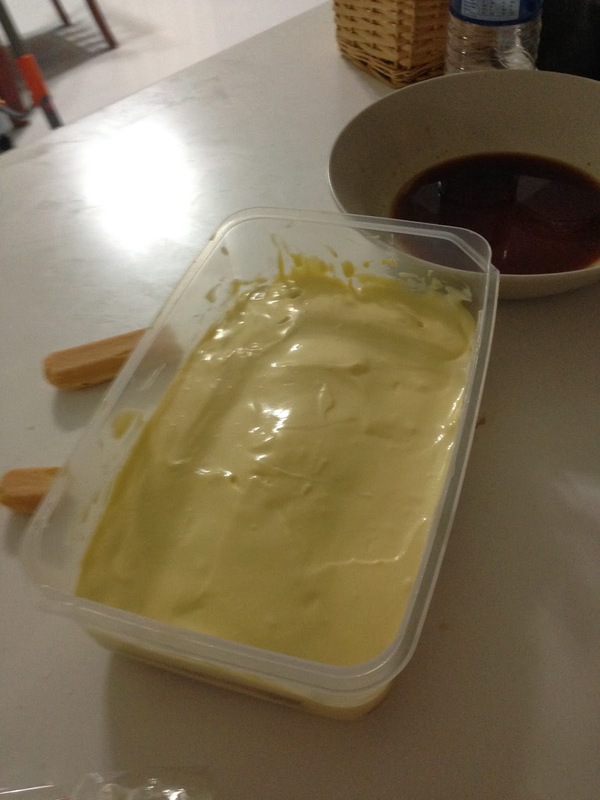 i found the recipe here, if you're interested to try it out for yourself. i wanted to put some raspberries on top, but i couldn't find any at the grocery, so i just made do with some apricots. i hope you all have a great Chinese New Year holiday... and Gong Xi Fa Cai to all of you who celebrate the Lunar New Year! ca fait longtemps que j'ai fait une recette française. 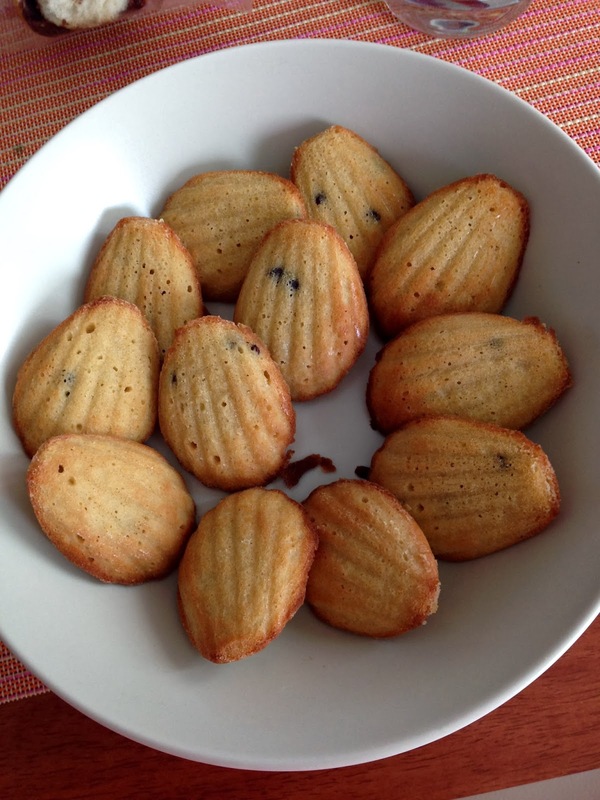 c'est pour ca que aujourd'hui, j'ai décidé d'essayer faire les madeleines. c'est l'un des gateaux français que je prefère. je me rapelle, quand j'étais en France, je les mangeais pour petit-déjeuner presque tous les matins. je spécialement prefère ceux aux pépites de chocolat. 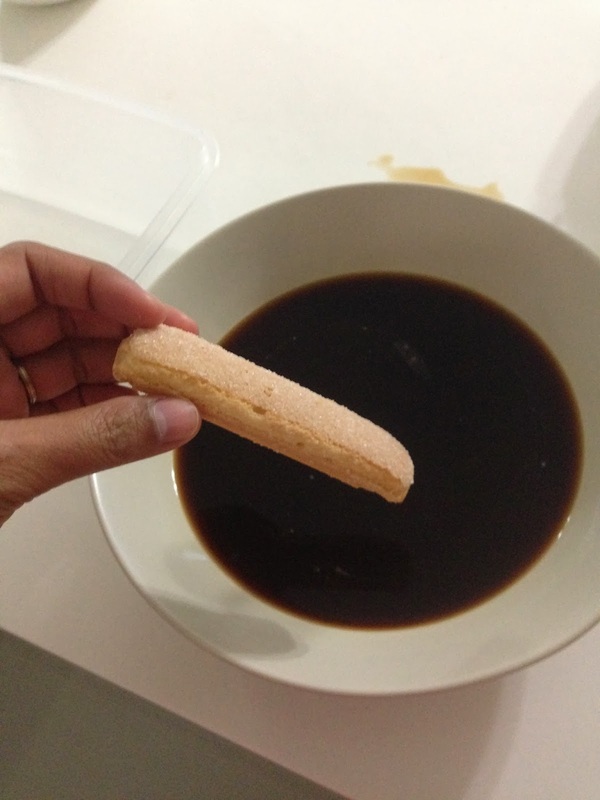 ce qui m'etonne ici à Singapour , c'est que c'est toujours difficile de trouver l'extrait de vanille pûr et bien aussi les moules pour faire les madeleine. mais, j'avais de la chance, parce que j'ai démandé ma belle-mère avant d'arriver ici a Singapour pour ses vacances de m'amener quelques ingredients et les moules pour les faire. 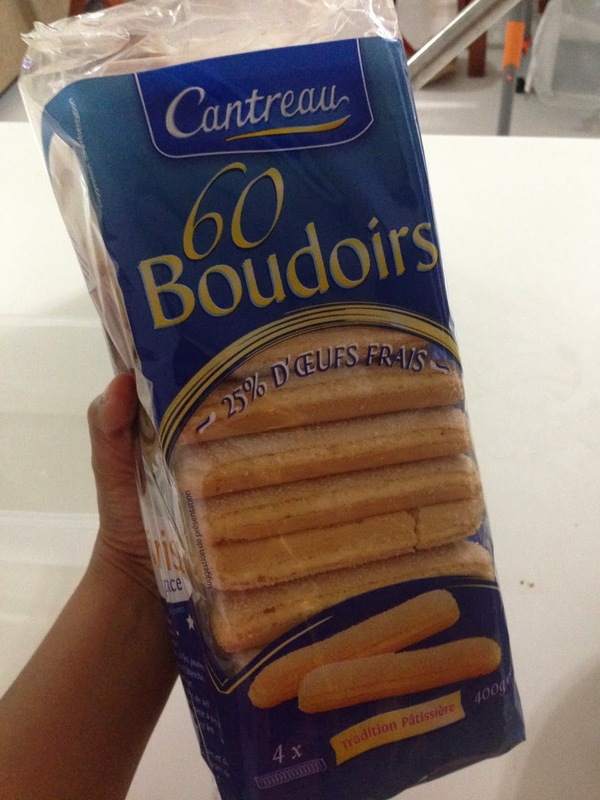 les trucs amenés par ma belle-mère qui viennent de France -- même si ils sont pas les extraits "pûrs", ils sont meilleurs que les trucs qu'on peut trouver ici à Singapour. j'ai suit la recette ici. mais, j'ai remplacé quelques ingrédients pour avoir la touche personelle. 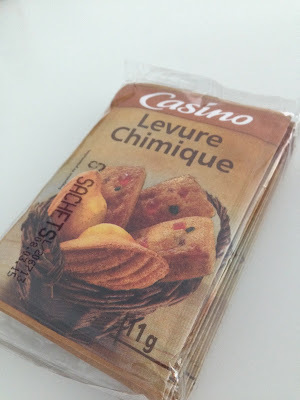 j'ai utilisé la levure chimique qui vient de la France, et j'ai ajouté l'extrait d'amande et les pépites de chocolat. un petit conseil: ne pas ajouter trop d'extrait d'amande parce que c'est très fort, et ca donne le goût amer. 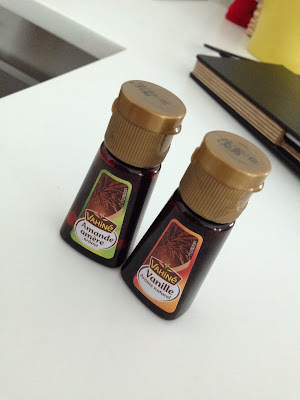 je prefère d'utiliser cet ingredient à la place de l'extrait de vanille... j'en ai trouver ici à Singapour chez Cold Storage une fois, mais quand je suis revenu j'en ai plus trouvé, malheureusement. c'est bon aussi pour les "pancakes", etc. aussi, j'aime utiliser la cassonade à la place de sucre blanc. mais, ca c'est juste une question de goût. 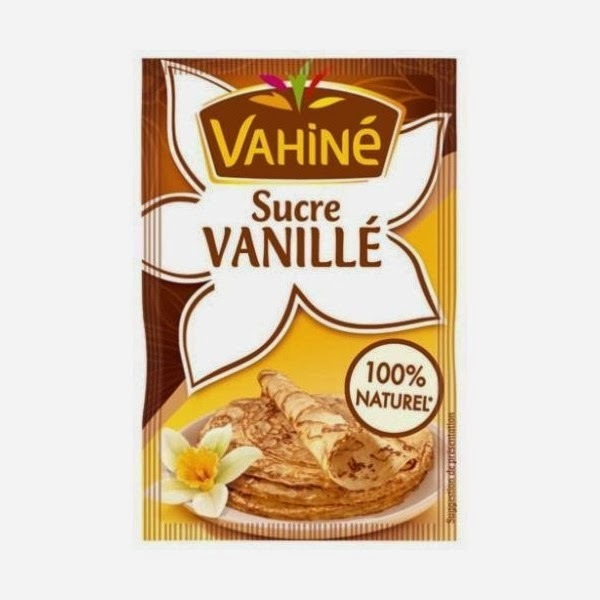 et si tu veux, tu peux aussi ajouter le sucre vanillé pour remplacer l'extrait de vanille. ca c'est pratique si c'est vraiment difficile pour toi de trouver l'extrait de vanille pûr. 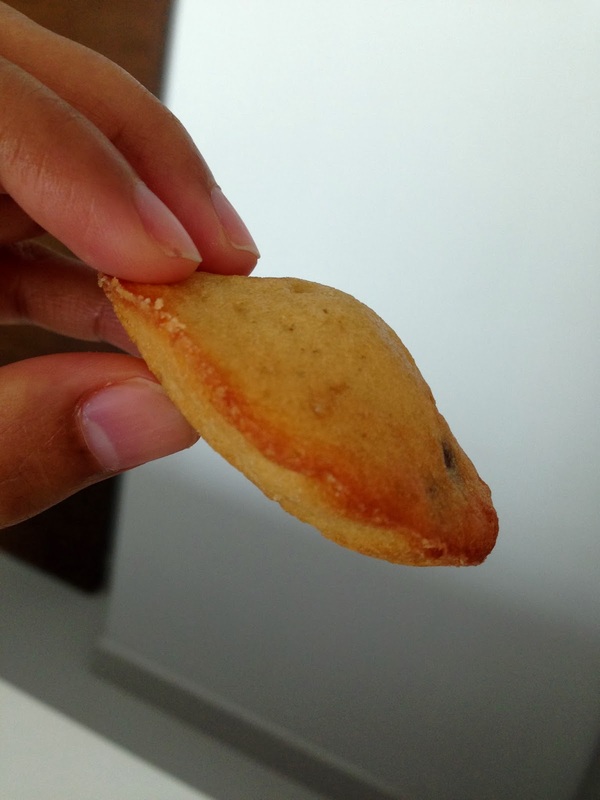 je suis très fière de moi pour avoir faire les bonnes madeleines pour la première fois. for our Farewell Party last weekend, i decided to make a Graham Cake. in the Philippines, we usually refer to this as Crema de Fruta. i prefer to call it Graham Cake. i have checked several web sites and videos on the internet and took a little bit of something on some of them to make my very own recipe. what is challenging here in France, when trying to cook something, is finding out first the french name of the ingredients that you need. and that you wouldn't find them in the milk and dairy section of the grocery. they go with the confiserie section, together with all the other baking ingredients that you need. they sometimes come in a tube or a small pack like this one in the above pic, not just in the usual can. for the fruit cocktail and gelatine, it's quite easy. the Graham crackers, i got from a friend who was recently in London. they apparently have a wider selection of Filipino foodstuff there. although, you can use other types of cracker. here in France, you have Speculoos (the Greek biscuits). you can use it if you want. but i don't like it so much because it has cinnamon. 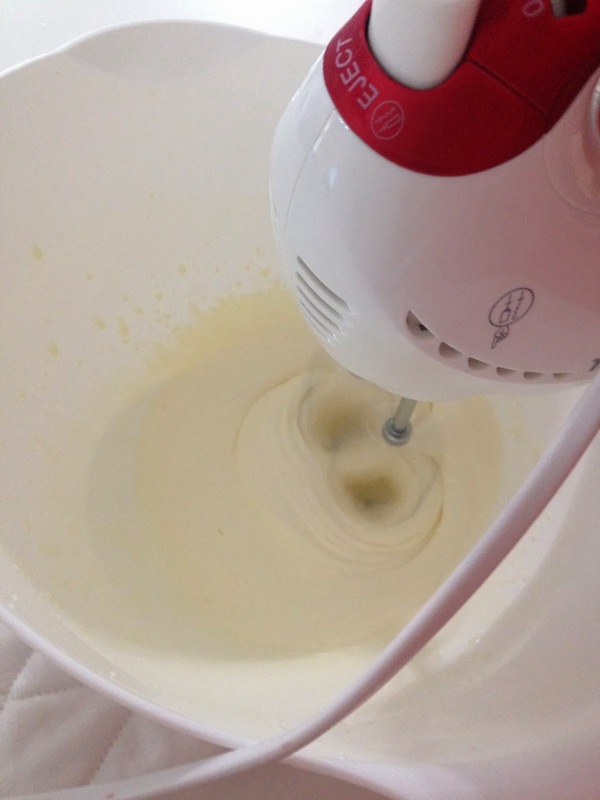 for the first time in my very-recent cooking life, i'll be using this electric hand mixer that was given to me by my mother-in-law. it's really nice. you can even use it with batteries. i was a bit afraid at first that i bought the wrong cream. it should be the full cream type. the one that gets thick with whipping. but i was right. 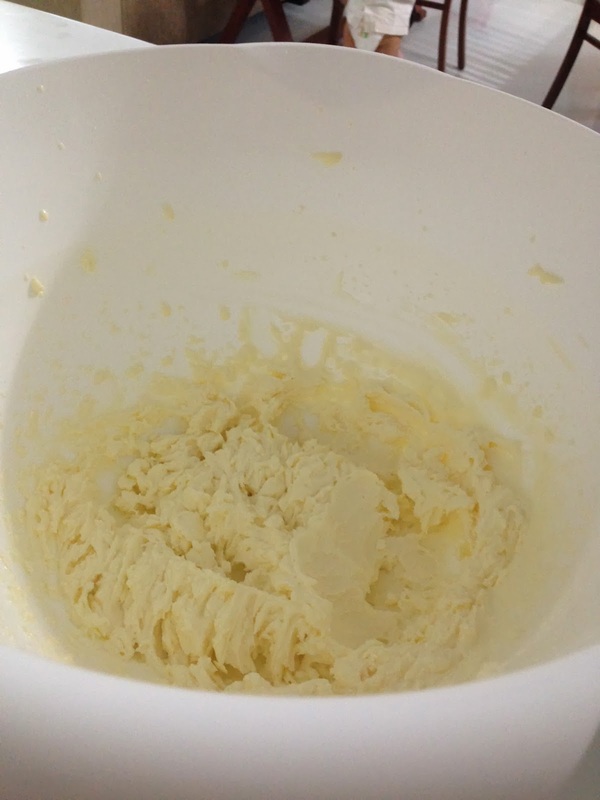 it thickened in just a few minutes. 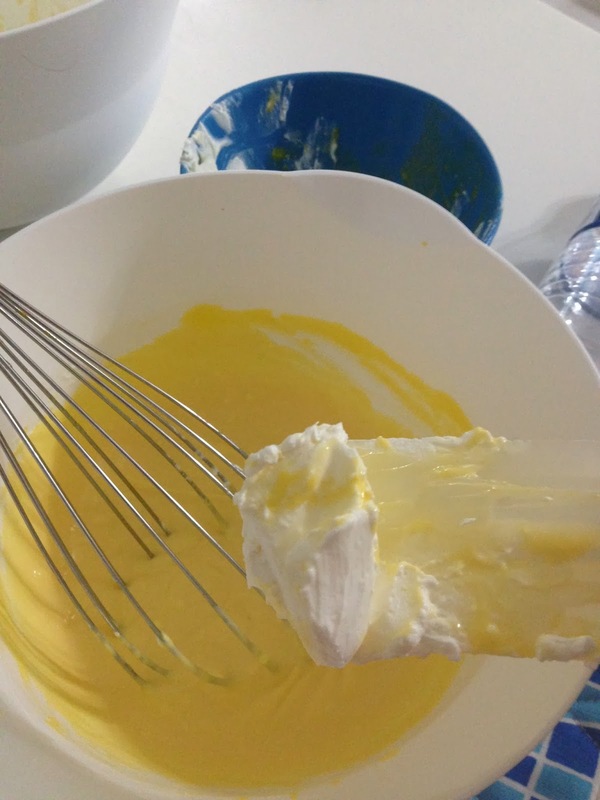 as for the procedures: you just need to mix the condensed milk with the whipped cream according to the sweetness that you prefer. and then, layer all the ingredients in the following order: graham crackers, cream+condensed milk, fruit cocktail. do this twice. and then set aside in the fridge while you prepare the gelatine. don't forget to drain the fruits of the syrup. as a personal touch, i kept the syrup and used it for the gelatine mixture. but first, you have to immerse the gelatine strips (i used three of them) in ice-cold water for 10 minutes. and then you heat up the cocktail syrup and put the softened gelatine strips in them. let cool, and then pour onto your graham cake. i let my graham cake in the fridge overnight before serving it. i find that it is more solid and nicer this way. i wanted to visit Madrid first of all, to see a friend from Singapore who was having a grand European tour. it was so nice to see her again after a long time. we had such fun catching up, soaking in the sights and sampling the gastronomic Castillian delights. first night we saw each other, we met at the oldest Tapas Bar in Madrid called, Stop Madrid. it was recommended by my french guidebook. 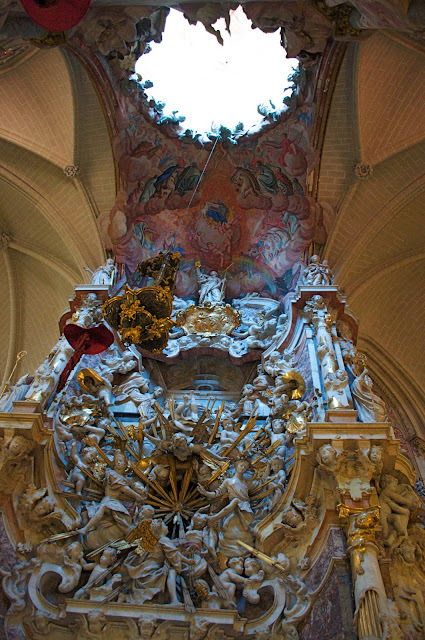 the place was just a few steps away from Gran Via metro station, along Calle Hortaleza. i didn't expect to find a lot of people there as it was a weeknight, but it was quite packed. and it seemed like they were mostly locals, which is a good sign. the next day, i joined my friend and her buddies on a day tour of Toledo. 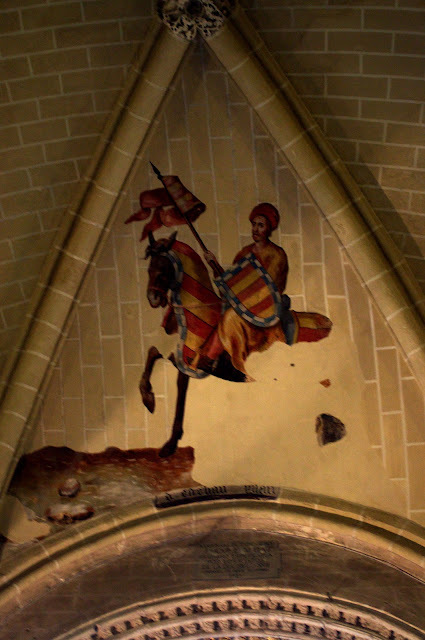 it's an ancient fortified city 20 minutes by train from Madrid Atocha RENFE station. arriving at the Toledo train station, i could not help but marvel at the interesting architecture. the train station was lovely outside and inside. from the train station, you could either take the bus that will get you to the town proper in less than 10 minutes, or you can take in more of the scenery on the way there by walking, which was what we preferred. The bucolic surroundings reminded me so much of the French countryside. what is quite unique about Toledo is that you can find traces of Arabic influence in the architecture as it was once occupied by these people. we stopped for a snack before heading to the famous cathedral. i noticed that there were so many young students on a field trip. and they were mostly from France. it was quite a lovely sunny day in Toledo, the walk around the city and hiking up towards the cathedral was really nice. ancient bible gifted by France to Toledo... how generous! we spent quite a lot of time inside this cathedral. i guess it was the highlight of the trip. as i have spent a lot of time here in France already, touring around really old churches, i didn't find this cathedral so special anymore. although, i would say it is quite unique for its arabic influence in the architecture. 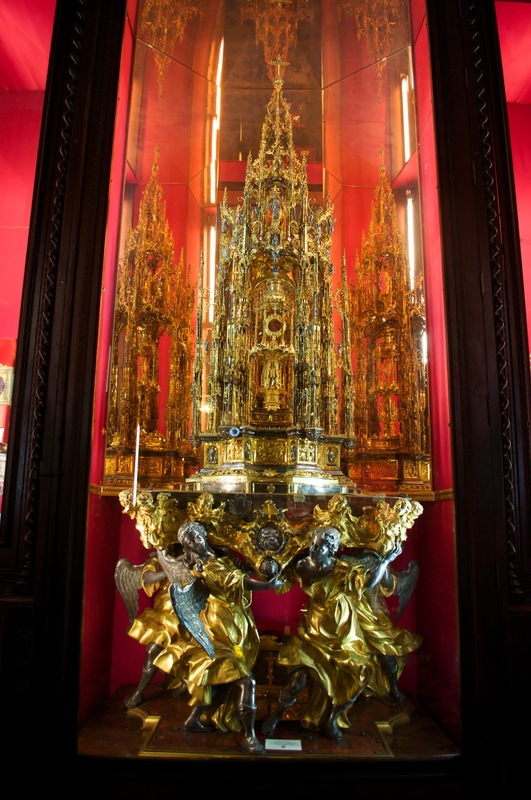 and it also shows how rich the Catholic church is with all the gold and silver artifacts found in one of the vestibules. for lunch, we went to this place called El Brocal Taberna. this one was recommended by Trip Advisor, researched by moi. the Spanish people seem to like being late in everything, including meal times. we had lunch at 4PM. and dinner at 10PM. back in Madrid, we chose this place to dine in, which claims that it is the OLDEST restaurant in the world as recorded in the Guinness Book of World Records. quite a huge claim. especially when you consider that the word restaurant is french and not spanish. i was not able to take a lot of pictures around Madrid, especially since my last day in Madrid was spent inside the museums. 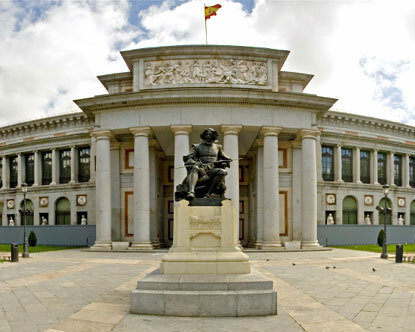 i first went to Prado Museum and lost track of time admiring the works of Velasquez, Rembrandt, Goya, et al. i especially adored Las Meninas and Goya's Black Paintings (Pinturas Negras). although, having seen Picasso's version of Las Meninas at the Picasso museum in Barcelona, i would say that i prefer Picasso's version to the original. it was still quite magnificent, though. and i regret to say that i was too lazy to take pictures at this time, so i just borrowed some pics from other web sites. 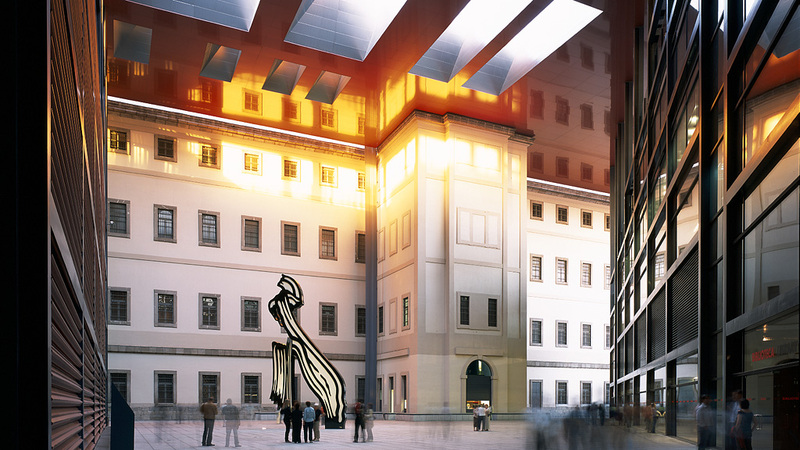 from Prado museum, i hurried towards Reina Sofia museum by foot. i didn't realize how far away it was. when i got there, i only had time to admire Picasso's Guernica and a few of Miro's works. i regret to say that i wasn't able to see the temporary exhibit on Dali's works. but then when i got to the airport, i found out my flight would be delayed for an hour. i took Iberia Airlines, btw. they have this teeny tiny Canadian planes flying from Toulouse to Madrid and vice-versa. it was a bit too small for comfort. my bag didn't fit in the cabin. i had to squeeze it below the seat in front of me. it barely fit in there too. since i didn't have time to buy pasalubong around Madrid, i stopped by some shop to get some charcuterie and sweets. they were quite expensive. the sweets were not so good, but the pata negra was worth every cent. i really enjoyed every bit of my trip in Madrid. It has somehow shown me a glimpse of my roots from learning more about Jose Rizal, to finding more and more Filipino words rooted in Spanish, to some old habits that die hard like being late for everything and having a siesta, etc. even the flight back to Toulouse, despite being an hour delayed was worth it, with the magnificent view of the Pyrenees from atop, welcoming me back to France.